Old Lyme WPCA Chairman Richard Prendergast, standing center with microphone in the far distance, gives his presentation last night with residents in the foreground standing in the foyer since all seats were taken in the Meeting Room. 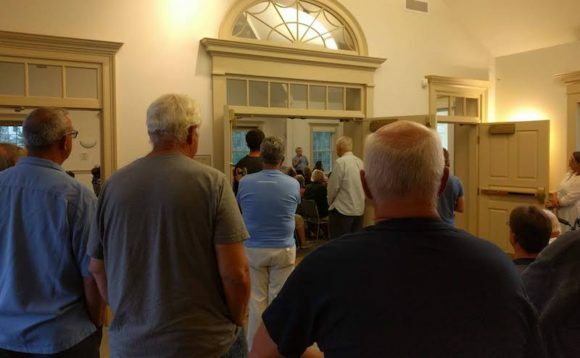 More than 100 people packed Old Lyme Town Hall’s Meeting Room last night with some standing around the perimeter of the room and another 25 standing outside in the foyer to listen to the town’s Water Pollution Control Authority’s (WPCA) Chairman Richard Prendergast give a presentation on where things stood currently with the proposed installation of sewers in Old Lyme. More to follow on this story later today.